1. Uses client names all the time, and makes a connection each and every session. Greet clients by name as soon as they walk in. Do they have a nickname or preferred name? If so, use that. Always ask how your clients are feeling. It shows you care and tells you about their training readiness. Use the client’s name first when you cue him/her. This is important during group sessions, so they know who that cue is directed to. Plus, people tend to enjoy hearing their name said aloud, especially in front of other people, because it makes them feel like they are being recognized. Even if someone is trying to hide in a group class, it’s important to make sure they still feel like they are getting coached. 2. Is always proactive, and not reactive. Stay one step ahead of the client. Be Johnny-On-The-Spot for clients, and don’t wait for them to come to you with questions. Ask them questions first. This differentiates active coaching from passive coaching. 3. Works the training floor by coaching at all times. When you step onto the coaching floor, you are on display. And you are going to work. Your number one priority is to be coaching. This means your focus is entirely about the client. When on the training floor, ask yourself “What am I doing right now?” And if the answer is anything other than coaching, you need to immediately reengage. Use engaged coaching postures to reinforce this. This means not sitting on or leaning on equipment, like you’re disinterested. Project great posture, strength, and confidence. Keep appropriate proximity, so you don’t need to yell across the gym to a client. Err on the side of overcoaching. It is easier to dial back than try to turn it up. Plus, most people are there because they want to be taught, and taught the right way to do things. 4. Has eyes on clients at all times, or as much as possible during a session. This is obviously even more important for the less experienced clients. Back-to-the wall coaching will help ensure that you never turn your back on a client. That screams “you’re not important.” Make sure all clients are in your field of vision. Prioritize your attention to the most technical or coaching-intensive exercises. Sometimes simple things need to be reinforced to coaches. For example, while clients are performing exercises, don’t be putting away equipment, straightening things up, or looking out the window. Be fully engaged. 5. Demonstrates for clients often. Most people are visual learners. And rarely will clients admit unsolicited that they don’t understand what you’re talking about. So they might not understand what you’re asking of them until you SHOW them. Verbal-only coaching is lazy coaching. A tried and true method for giving cues was popularized by John Wooden. Right way, wrong way, right way. Set up to demonstrate an exercise. Show clients what you want them to do. Then show them what not to do. Then show them what to do again. 6. Is in charge of the room, and has a presence. Have an air of confidence and be able to explain the “why” behind an exercise. This gives you value and trust with your client. Also, coach what you know, confidently. This helps empower you to stay in charge of the room. Have voice projection. You will need to direct traffic and control logistics, especially during group sessions. This may mean getting out of your shell a little, so get over it. 7. Identifies the most coaching intensive, technical, or highest risk exercise at any given time. 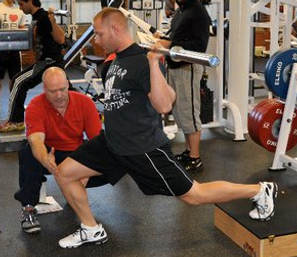 This is especially critical during group training, and logistically organizing your clients. For example, if a workout includes kettlebell swings, it makes sense to position that somewhere closer to the edge of the training floor, where there’s less risk of it accidentally hitting someone. This concept also applies to where you position yourself. You probably need to be closer to a barbell movement to give coaching cues, rather than something less complex like a med ball chest pass. You also might need to position yourself closer to a person that needs more attention. 8. Has his head on a swivel. This ties in to #4. You should be able to see almost everything at any given moment. Back-to-the-wall coaching comes in to play here again. Even if someone approaches you with a question during a session, you should still be able to see what’s going on around you. Don’t be stuck in one place. Change your coaching angle frequently. You can’t see all angles at any one time. If someone is doing a squat, it may look fantastic from the side, but from behind you may see a big weight shift to the left. 10. Is a personality chameleon. Know who you’re coaching. You may have an elderly client, where you need to be softspoken. Or you may have a pro athlete that you need to ratchet up and yell at them to get motivated. Adjust accordingly. Be able to change from session to session, even in the same day. This will also help significantly with client retention. 11. Observes and models other experienced coaches. You get better by watching other people coach, especially if they are better than you. It can validate what you are doing. It can also make you aware of your shortcomings. “I planned my lesson. I taught my lesson. And then I received feedback on my lesson. And after that, I watched him teach, and spent another hour or two watching him teach the same lesson to the students. The key is to not repeat those mistakes twice. 12. Asks the question “what do WE have next?” throughout the session. It is about using the word WE, not YOU, because you and the client are a team. 13. Gives and asks for feedback often from managers and clients. It’s important to lose your ego. Clients, coaches, or managers may need to be challenged, but challenged respectfully. People will receive that feedback much easier. And we want the feedback implemented immediately, so they don’t make the same mistake again. If you’re going to make a mistake, make a new mistake. It’s important to not be afraid to be wrong. Listen to other experienced coaches who admit they were wrong. If you’re a manager, debrief at start of the day to discuss what to work on that day. Or throughout the day to give feedback on how things are going/went. Use the praise-correct-praise method, to help it sink in better. With clients, get feedback each day on their readiness. “How do you feel?” Get specific, so you know what to adjust on the fly. Don’t just say “good job” to client. Tell them WHY it was good and what they did well. 14. Is prepared before starting the session. Failing to prepare is preparing to fail. Have exercises and weight loads picked ahead of time. Give yourself time to get the room or class set up. Why are these traits so important? It demonstrates to your clients that you care.